I am Kalyan Chattopadhyay from West Bengal, India. 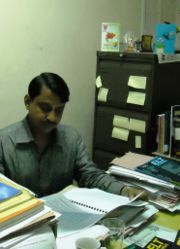 I would like to introduce myself as an Assistant Professor in the Department of English, Bankim Sardar College, South 24 Parganas, West Bengal.I also coordinate activities of the Centre for Communicative Skills in English in my college which offers courses on for the communication skills development of the tertiary level learners who come from socially and economically disadvantaged section of society and with very little English. Besides I have been serving Rabindra Bharati University as Guest Lecturer and extending my service to the School of Languages and Culture in designing and conducting courses for the visiting students from universities abroad. As a visiting faculty I conduct sessions for MA English and MA ELT courses offered by University of Burdwan and Netaji Subhas Open University. I am interested in the emerging learning technologies and their applications in the field of English language teaching.I have conducted many teacher training programmes on the use of learning technologies in instructional and assessment design in various English language teaching Institutes in India.I have presented workshops and papers in teaching institutions and academic conferences and seminars in India and abroad. Designed and developed training materials for the Communicative English for Department of Information Technology, Govt. of India funded project on ITES BPO Banking Verticals in 2008. Worked as Principal Investigator in University Grants Commission sponsored research project on Requirements of Communicative Skills in English in Today’s Workplaces, 2006-2008. ICT in Basic Education (English) Govt of Uzbekistan, funded by Asian Development Bank with Dr Susmita Pani. Developing of a Course handbook on Communication Skills in Workplaces, to be published from Cengage Learning. Awarded Professor M.M.Bhattacharya Memorial Gold medal for securing highest marks in MA English examination in 1993. Awarded full scholarship and travel grant to conduct workshops at AsiaCALL International Conference 2008, held at the Institute of Social Technology, Suranaree University of Technology (SUT), Nakhon Ratchasima, Thailand from 21 to 23 November 2008. Awarded by the Hornby Trust,UK,One Year Hornby Scholarship managed by British Council to study MA TESOL & ICT at the University of Leeds for the academic session 2009-2010. Executive Committee member AsiaCALL and Vice President IndiaCALL . Website Manager, Global Issues SIG, IATEFL . Kalyan Chattopadhyay, Multimedia in the presentation of Teaching Learning materials : Introducing Audacity for the Language Classroom, Redefining the Role of Language in Higher Education,SRM University, Chennai, 2009 ISBN 978-81-908397, pp.19-23. Kalyan Chattopadhyay,Professional Development Through Yahoo Groups,Teaching And Learning English For career Development, Krasnoyarsk Regional In-Service Teacher Training Institute,Siberian Federal University,2008,ISBN 978-5-8173-0366-0,pp.133-141. Kalyan Chattopadhyay, Empowering the Teacher in E-assessment , Rabindra Bharati Patrika, Vol. 10, 2007, pp. 387-399. Kalyan Chattopadhyay,Use of Educational Technology In Language Classroom: Some Practical Inputs, Teaching Communicative English at the Tertiary Level, Proceedings of the UGC Sponsored National Workshop, Bankim Sardar College,2006, pp55-64. Kalyan Chattopadhyay, Convergence of Expectations: Developing Curriculum on Communicative Skills in English for the 21st Century, DIVINER, Vol.3 No.2 September 2006,DAV College, Chandigarh, pp140-150. Kalyan Chattopadhyay, No turning back: the dialectic of difference and identity in ′No Longer at Ease′, Journal of the Department of English, RBU, Kolkata, Vol –IX, , pp32-36. Kalyan Chattopadhyay, Buchi Emecheta: Tradition and modernity in Nigerian Fiction about Women, Rabindra Bharati Patrika, Vol. 9, 2006, pp. 346-350. Kalyan Chatterjee, Peeping through Lattice of ages: Race, Ethnicity and Cultural expression in Shakespeare’s Othello and Baraka’s Dutchman. Journal of the Department of English, RBU, Kolkata, Vol –VIII, 2002-2003, pp101-110. Kalyan Chattopadhyay, Erotics of possession, its mysteries, and mechanism: An examination of Sonnet 129. Ritichhanda, vol-3, June, 2002, pp16-21. Kalyan Chattopadhyay, The Playing of Different Natures with Joy and Sorrow: Keats’s Otho the Great. Journal of the Department of English, RBU, Kolkata, Vol –VI, 2000-2001, pp143-152. Kalyan Chattopadhyay, Sparks from the Unextinguished Hearth: The Impact of Shakespeare’s Sonnets on the Representative Bengali Sonneteers. Colonial and Postcolonial Shakespeares, Avantgarde Press, Kolkata, 2001, pp161-168. Invited as Resource person to conduct an orientation programme on Curriculum on Communicative Skills Development for the teacher participants at St. Aloysius College, Jabalpur, Madhya Pradesh, NAAC Sponsored National Level Seminar in July 2006. Presented a paper on Students’ Empowerment Curriculum for the 21st Century: Developing Communicative Skills in English for Employment at the IV International Srilanka Language Teachers’ Association (SLELTA) Conference at BMICH Colombo, Sri Lanka in August 2006. Invited as Resource person to deliver a talk on Communication Skills Development: New age requirements at NAAC Sponsored State Level Seminar on 10th August 2006 organised by Ramakrishna Mission Residential College, Narendrapur. Invited as Resource person to give a presentation at All India Seminar in September 2006 at English Language Teaching Institute, Guwahati, Govt. of Assam, 4-5th September 2006. Presented a paper on Convergence of Expectations: Developing Curriculum on Communicative Skills in English for the 21st Century at the International Symposium on ELT, Sponsored by US Embassy, India, 22-24th September, 2006 at DAV College, Chandigarh. Invited as Resource person to conduct a paper reading session at All India Seminar on Teaching English through Edusat, Sponsored by ISRO at Regional Institute of English, Bangalore, 15- 17th November 2006. Invited as Resource person to conduct workshops on Using Games for Young Learners in ESL/EFL classroom and Using easily accessible supplementary materials in ESL/EFL classroom at All India Seminar organized by English Language Teaching Institute, Ranchi, Govt. of Jharkhand, 15—16th December 2006. Invited to present paper on Empowering the Teacher in E-assessment at International Conference on e-Learning in Teacher Education, Delhi University, 26-28th February, 2007. Invited to present paper at the All India Seminar on Developing practice materials for Speaking: English Language Teaching Institute, Allahabad on 17-18th March, 2007. Invited to present paper on Developing Listening Skills : Challenges for the Textbook writers at the All India Seminar on Dynamics of Language Texts: English Language Teaching Institute, Bhopal on 4-5th April, 2007. Invited to present paper on Empowering ESL/EFL Teacher through ICT: Reviewing the e-assessment Methods and Tools at the Asia TEFL MELTA International Conference at Kuala Lumpur, Malaysia, 8-11, June, 2007. Only Indian Faculty to be invited to conduct workshop on Collaborative Language Learning through Yahoo Groups for the participants at the International Conference of ‘New and Emerging Technologies in English Language Teaching.’ Organized by (IATEFL) Learning Technologies SIG, UK at Loyola College, Chennai – 3-5 August, 2007. Invited to give a talk on Developing listening skills through Podcasts at the National Seminar organized by the Institute of English, Kolkata on 28th August 2007. Invited as a resource person to conduct an orientation session on “Teacher-learner synergy for empowering students” for the participants at NAAC sponsored national Seminar at Bankura Christian College on 12th October, 2007. Invited as a resource person to talk on Voice modulation in speaking English at English Language Teaching Institute, Ranchi, Govt. of Jharkhand, in 3rd November, 2007. Invited to conduct a workshop at the 4th CamTESOL conference at Phnom Penh on Using Cartoons for the language classroom on 23-24th February, 2008. Invited to conduct workshops on Analysing the texts and Textbooks and English at the Work place at the two day workshop on ELT Pedagogy and English Textbooks at the Tertiary Level conducted by ELTI, Assam in collaboration with Assam Higher Secondary Education Council on 19th – 20th March 2008. 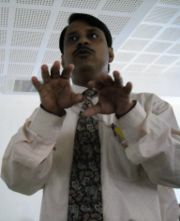 Invited to present workshops on "Dictogloss in ESL Classroom” and “Using Films in ESL Classroom" for Sri Lanka English Language Teachers’ Association conference at Maharagma, Sri Lanka in August 2008. Invited to present workshops on e-Management of Community-based Projects and on Learning Management through Moodle at H M Patel Teachers’ Training and Researcher’s Institute on 18-21 August 2008. Invited to give a talk on Training the BPO Professionals: Challenges before the Communication Skills Trainer at ELTI, Jharkhand, 19th to 20th November, 2008. Invited to conduct workshops on Creating Learning Content with eXeEditor and Enhancing listening and speaking skills using advanced sound editing software at the 2008 ASIACALL 7th International Conference to be held at the Institute of Social Technology, Suranaree University of Technology (SUT), Nakhon Ratchasima, Thailand from 21 to 23 November 2008. Invited to present paper on ICT Support for Education for Sustainable Development at the UGC sponsored National Seminar organised by the Department of Education, Rabindra Bharati University in March 2009. This page was last modified on 6 July 2013, at 12:46.